This busy city is situated right by the beach, providing tourists with various options to fill their day. You definitely won’t get bored here, and the views certainly don’t hurt! We took a sleeper bus from Mui Ne to Nha Trang and thought that it was an adequate means of travel for only 340,000 VND (16 USD for 2 tickets). Ha Van Hotel: Even though this place wasn’t on the beach, it was still one of our favorites in Vietnam. We paid only 26 USD per night for a great room and a delicious breakfast (included). The rooms are comfortable, clean, and have everything you could need…A/C, cable tv, wifi, a minibar, and hot water. Inside the hotel, there is a Coffee Shop with Gelato and other sweets, as well as a rooftop bar/restaurant. The staff are very helpful and speak decent English…which is definitely not always the case. They booked our overnight train to Da Nang and organized a room for us in another great hotel. The location of this place is perfectly central. The beach is only 2 blocks away, and you are still right in the heart of the city. If going to Nha Trang, stay here! Not bad for a free breakfast! Scuba Diving: Nha Trang is a major scuba diving hub of Vietnam. Diving here was fun, but nothing to write home about. It was still extremely enjoyable and cheap! And if you’re interested in getting certified, this would be an awesome place to do it, at a spectacular price! We did our diving with Sailing Club divers and had a great time. Beach: Relax on the golden sand of this crescent shaped bay with views of mountainous islands dotting the ocean. Vinpearl: Take the longest over-ocean cable car in the world to this 5-star resort and theme park on Hon Tre Island. Thap Ba Hotsprings: If you want to take a break from sightseeing, get a mud bath! We didn’t have a chance to do this, but heard that it was nice. 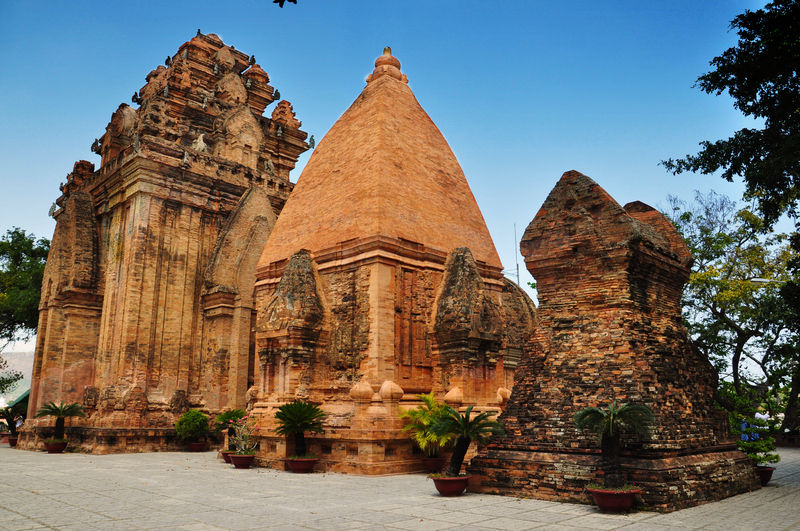 Ponagar Cham Towers: Take a step back in time and appreciate the beautiful architecture of this awesome temple. Admission is super cheap and this visit won’t take long, but definitely worth checking out.